In the last two years, ammonia emissions from agriculture has become a key policy priority for the Ulster Farmers’ Union. Despite the seriousness of the issue, DAERA and NIEA did not make the industry aware of their concerns until late in the day and communication with the agricultural sector until recently was relatively poor. Approximately 30 kilo tonnes of ammonia is produced from agriculture in Northern Ireland each year and agriculture is responsible for the majority of emissions. There is a perception that intensive pigs and poultry farms are the main source however, the fact is that around 70% of the ammonia in NI comes from cattle. Ammonia (NH3) is a natural and invisible gas, which is produced in livestock housing, slurry storage and spreading and from fertiliser application. Reducing emissions in NI is now a priority for the Department of Agriculture, Environment and Rural Affairs (DAERA). The main concern about ammonia is that when it is emitted into the air it is subsequently deposited as nitrogen onto land and water. Nitrogen deposition occurs in gaseous form close to the source (dry deposition) or through rainfall (wet deposition), often many miles from the original ammonia source. When it is deposited as nitrogen, it acts as a fertiliser and if this falls on species that are more sensitive it can cause damage and loss. Northern Ireland has designated land across the country as Special Areas of Conservation (SAC), Special Protection Areas (SPA) and Areas of Special Scientific Interest (ASSI). This land is protected by law and NIEA estimate that most of these designated sites and other priority habitats are receiving levels of nitrogen which are significantly above their “critical load”, the concentration at which significant ecological damage occurs. DAERA therefore want to reduce emissions to protect these habitats to allow them to comply with their EU and international biodiversity obligations. The UK also must meet reduction targets for ammonia to meet air quality commitments. 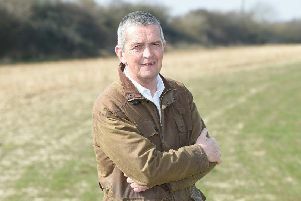 Currently ammonia is impacting on local farmers when they apply for planning permission. Planning rules require an assessment to be made on the impact of a development on protected habitats and NIEA will be consulted if there are any designated sites or priority habitats within 7.5km of the proposed project. Large pig and poultry farms which require an IPPC permit to operate will also have to take action to reduce ammonia. DAERA are now considering what further action is required from farmers to ensure that NI meets legal requirements in terms of habitats and air quality. The UFU have continued to challenge DAERA and NIEA on many aspects of this issue. Following the publication of the ‘Making Ammonia Visible’ report and subsequent UFU lobbying, DAERA have recognized there are gaps in the science and a number of research projects have been initiated at AFBI to improve the information and figures on ammonia emissions from local farms. The UFU have consistently highlighted concerns around the way ammonia is dealt with in planning. The UFU have been participating in DAERA Ammonia Stakeholder meetings to ensure that farmers’ issues and concerns are highlighted and are taken into account and the Union are working closely with other agri-food organisations to collectively lobby on this issue. The UFU President recently led a delegation to the Netherlands to learn more about their ammonia policy and the Union continues to brief local politicians on the issue. It is expected that DAERA will publish a consultation on an Ammonia Action Plan for NI in the New Year with a possible list of mitigation measures for farms. The UFU Policy Committees will be studying this document in detail when it comes out and will fight to ensure that farmers’ issues are recognized and for a practical solution to this new challenge.